Hello and welcome to another day of reading! I think one of the hardest things to do is pass up buying a book you KNOW you want/need/absolutely MUST HAVE in favor of reading one of the ones already at home. (Even though you KNOW there are tons to pick from!) Therefore, one definite goal/resolution for the year is to read some of the many, many books I have on the various shelves in my room. I’d been thinking of ways to try and motivate myself and figured I could start off by making a “realistic” reading list of ~4 or 5, and progress this way. Then I saw this jar picture! SO: for the rest I plan to put them in a jar like this one! I thought this was such a cute idea, plus it makes it a surprise so you never know what you’ll get! Just looking at this makes me want to do it right now! Haha I feel like that’s exactly what will happen to me, but you never know! 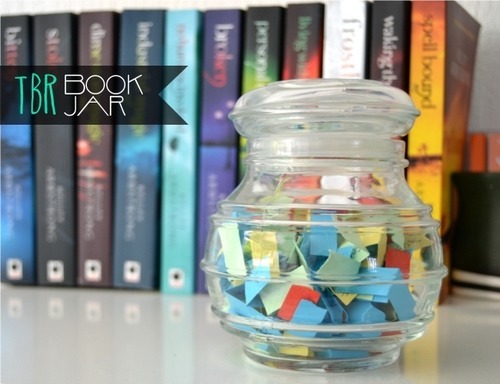 The TBR jar is such a good idea! I have a similar problem- there are so many books in my bedroom that I need to read, and yet I continue to buy more books or check them out from the library. Hopefully this will be the solution!